I attended the Atlanta Home Show this past weekend and saw hundreds of different products & services, as well as a few great ideas. I’ll write more about those great products and ideas in a post in the next few days. Keynote John Gidding was also there from HGTV’s Designed to Sell and Curb Appeal. Be sure to check out my video of John talking about taking a project from conception to fruition. The video is towards the bottom of this post. 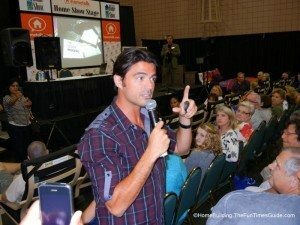 My wife and I stood amongst the masses to listen to him talk about what he does on the show and his thought process when he is creating a makeover for the exterior of a home. Audience member: Why doesn’t HGTV have more shows related to the senior citizen age group? John Gidding: If you know me then you know that I’m going to give you an honest answer every time. The reason is because the advertising dollars are targeted towards the younger crowd. Thus, the reason for seeing a majority of younger couples in all of the episodes. Audience member: But aging baby boomers have lots of money — if not more — than the young ones. John Gidding: When the advertising dollars start to skew towards an older audience, then the featured couples will be older. I can only tell you what HGTV’s reasons are for what they do. Audience member: If the outside of the house is a traditional style, is it okay to have an open floor plan on the inside or should you keep the inside traditional, too? John Gidding: Great question. It’s fine to have an open plan. You don’t have to blow it out entirely. You can open up a couple of rooms to modernize it. One of the first things he mentioned was that when you have a remodeling project for your home, you should always take all of the measurements of the space yourself. This will allow you to speak intelligently with contractors and suppliers about the project. You will have firsthand knowledge and that is very important. John earned a Bachelor of Arts in Architecture at Yale and followed it up with a Masters in Architecture at Harvard’s Graduate School of Design. While at Harvard, one of his professors asked all of the students to go to the law building and measure it — all of it — top to bottom, doorways, windows, hinges. The object of that exercise was to emphasize how important it is to know the scope and size of your project before beginning it and to be familiar with every inch of it… literally. How do I circulate through the space? What do I like about the space? Write down the questions first but don’t necessarily write down the answers to these questions. That’s because the answers will change over time. As time progresses, questions will turn into answers. Draw some sketches of what you see vs. what you want to design. His example of this was a badly cracked sidewalk in the front of the house that wasn’t a design element of the project, but rather something that needed to be dealt with — to repair and make better. He sketched a badly cracked sidewalk on his initial drawing to emphasize it. It could be different elements that need tending to — such as a set of windows that need to be improved upon, a front entryway, you get the idea. …drawing what I see vs. drawing what I want to design. That is the key to the whole process of a successful project. Successful, meaning it will be a project that you can look back on when it’s complete and not want to make one single change to it. In other words, you’re happy with the outcome.